Top 10 Honeymoon Spots in the U.S. These top 10 honeymoon spots prove that you don’t have to venture abroad to plan a spectacular honeymoon. There are some super romantic destinations right here in the United States. Consider some of these top options if want to spend more time relaxing and a little less time traveling. Maybe this isn’t the city or state that you thought would top a list of the best honeymoon spots in the United States, but it does top our list for one reason: The Resort at Paws Up. Located in western Montana, this is a working cattle ranch with nearly 40,000 acres, but it’s also a resort that offers one of the most unusual honeymoon opportunities around. While you can rent a private home and take advantage of the spa, the horseback rides, the hot air balloon rides, the fly fishing and countless additional outdoor adventures, it’s the luxurious honeymoon tents that should grab your attention. These spacious tents allow you to connect with the great outdoors while enjoying the luxuries of a fine hotel. Gourmet meals and wine are delivered directly to your tent, and you can enjoy a candlelight dinner under the stars while surrounded by spectacular mountain views. Spend your days fishing, hiking, riding horses or simply getting lost in the wilderness. Spend your nights sleeping on exquisite sheets and cuddling in the most comfortable tent ever created. 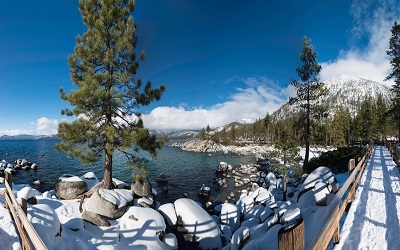 One of the most popular of our top 10 honeymoon spots, this large lake is positioned partly in California and partly in Nevada. It’s surrounded by the Sierra Nevada Mountains and is one of the most popular destinations for American honeymoons. That’s probably because it suits every personality. Beach lovers can visit in the summer and spend their time relaxing by the water. Nature lovers can visit virtually any time of the year and spend their time hiking or biking through the mountains. Snow bunnies can visit in the winter, spending their time at one of the area’s ski resorts. Risk takers can even plan on spending some of their time in the casinos. Regardless of what activities you choose, the amazing views will give you endless options for selfie backgrounds. This is the perfect destination for a winter honeymoon, but it’s also a great place to visit in the spring and summer when the mountains are green and fresh. With more than five honeymoon resorts in the area, you won’t be hard pressed to find luxury accommodations that keep you close to the big mountains glistening with snow. That’s where you’ll enjoy the usual snow sports like skiing, cross country and snowmobiling. It’s also where you’ll find yourself exploring new activities like riding a gondola to a restaurant that is elevated to approximately 9,0000 feet or taking the drop of your life on a bungee cord. If you prefer to stay out of the cold, wet stuff, visit in the warmer months when you can go whitewater rafting, kayaking, mountain biking, hiking or golfing. Spa services are available anytime, so don’t forget to pamper yourself. There’s a lot more to this city than Mardi Gras. Besides amazing Cajun and Creole food served in small diners and romantic dinners at more upscale restaurants, imagine shopping small boutiques while street musicians put on a show. What about spending an evening wandering through the French Quarter, enjoying a few drinks and listing to jazz and a variety of other musical adventure? Explore the plantations, wander through historical museums, ride the country’s oldest functional streetcar and board a steamboat for a river tour. Don’t forget to spend lots of time booking spa services and simply cuddling up with your sweetie in a romantic hotel. If you’re willing to venture across the Atlantic Ocean, you can create the illusion of traveling abroad without leaving the U.S. One of the most famous of our top 10 honeymoon spots, this scenic island is located south of Cape Cod, and you can only get there by crossing the Atlantic Ocean. Whether you take a ferry into Vineyard Haven or splurge on a scenic helicopter ride over the ocean, you’ll enjoy miles of pristine beaches as well as photo opportunities with beautiful lighthouses. There are small harbor towns to explore, but the wineries and breweries may catch your attention as well. This is the perfect place to go if you’re imagining a low-key honeymoon with plenty of time to simply relax with your new life partner. Check into one of the island’s many romantic hotels, book reservations for candlelight dinner at one of the five-star restaurants, and just hide away from the world in a serene environment. Some people dream of a white Christmas while others are dreaming of a white honeymoon. If you fall into the latter group, consider booking your honeymoon at Little Nell in Aspen. This is the only winter resort that requires you to ski your way in and out. The resort’s five-star hotel offers some of the cuddliest rooms suitable for a honeymoon, and they offer added amenities to bring more romance into your trip. If you visit at the right time, you could step away from the snow to add stargazing, biking and fly fishing into your itinerary. The Jeep tours are also fun if you’re up for an adventure. If crossing the ocean to reach Martha’s Vineyard isn’t your thing, just stick with Cape Cod. 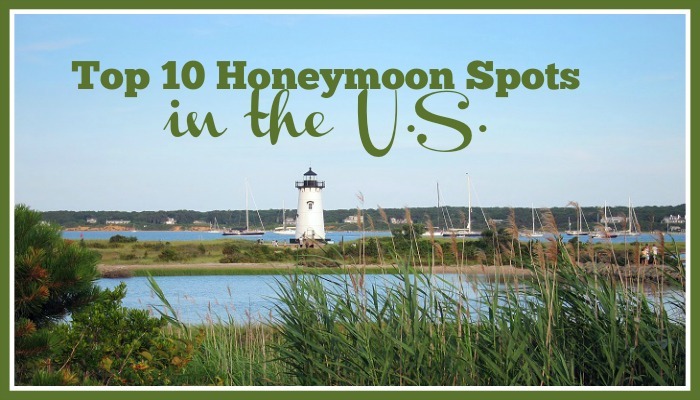 Here, at one of the most quaint of our top 10 honeymoon spots, you’ll get many of the same benefits with miles of sandy beaches, scenic lighthouses, and small towns waiting for you to wander and explore. You can also enjoy day excursions to Nantucket and Martha’s Vineyard, delivering the best of both worlds for a honeymoon packed with relaxation. You may feel like you’re jetting off to the Caribbean, but you’re really just venturing into some of the most beautiful U.S. territory. This island will deliver sights that you just can’t see anywhere else, including the rock towers in the Garden of Gods and humpback whales mingling with green turtles near the shoreline of Polihua Beach. Shipwreck Beach is also a must-see, especially if you or your partner is a history buff. 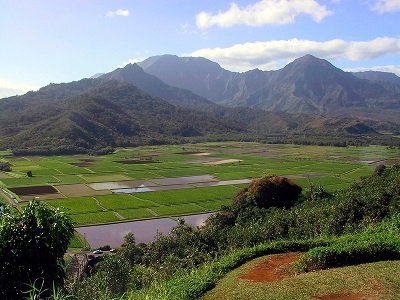 Besides the water activities, couples head to Lana’i when they want to avoid the crowds. Book a room in the Four Seasons Resort, plan to indulge in the concierge services, and enjoy an island that offers more exclusivity and privacy. Do you just want to check into an upscale resort and spend some time luxuriating in amenities on which you normally wouldn’t splurge? You can do just that when you escape to this luxury ranch and spa located about six miles from Santa Barbara. There are 17 miles of hiking trails that wander through the mountains, and you can schedule time with a hiking guide if you prefer. Biking into Santa Barbara or through the mountains is a popular pastime as well. While you’re relaxing in the resort, enjoy the year-round heated swimming pool, the fitness center, the yoga classes, and spa services performed right in your room. When it’s time to get active again, the wineries, breweries, shopping boutiques, and beaches of Santa Barbara wait nearby. While we’re talking about California, consider heading north of San Francisco if you love wine. The tastings happen all year long, and you can enjoy some delicious restaurants and live entertainment throughout the valley as well. Many couples choose this honeymoon location because they enjoy being surrounded by spectacular views of the countryside just as much as others enjoy views of the ocean. Besides the wine, there are many luxury resorts that will provide endless romance, relaxing pools, spa services, and concierge services to help you plan activities that fit your personality. Which of these leading top 10 Honeymoon Spots in the U.S. appeal to you most? There are options for every personality, every budget and every location. Select the one that works best for your wedding season and your idea of relaxation. Home > Most Popular Honeymoon Vacations > Top 10 Honeymoon Spots in the U.S.